Second place winner is Ava Nardone – 6th grade Davis Middle School – missed the word valise in the 16th round. Third place is Lola Adeyinka of West Hall Middle School. She missed the word gaiters in the 13th round. 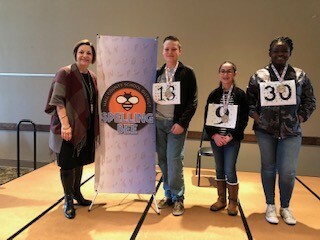 Both Colton and Ava will represent Hall County in the Region spelling bee on February 23rd at Sewell Mill Library and Cultural Center in Marietta Ga. If they move on to the State level- it is March 15th at the Georgia State University Student Center in downtown Atlanta. 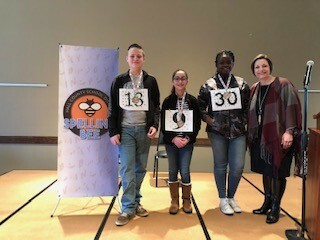 We had 17 rounds of the spelling bee. 35 participants representing 23 elementary and middle schools. It was held at The Oaks at 9:00 am on February 1, 2019.